The awards this month are to Joan Altabe, an art critic; Heather Mac Donald, a cultural critic and public policy scholar; Lynne Cheney, a public policy scholar and former director of the National Endowment for the Humanities; Rupert Christiansen, a music critic for the London Telegraph; and Julian Spalding, a former museum director in Scotland. As indicated by the just-revised introduction to the Awards, they "pertain only to the individual's views on art as specified in the award citation--independent of any other beliefs held, whether in respect to art, philosophy, politics, or culture." Cultural historian Jacques Barzun--recently reported to be completing his thirty-eighth book (see "Age of Reason" below)--turns 100 on November 30th. A brief biographical sketch by Timothy P. Cross of Columbia University, where Barzun was a student and subsequently a celebrated faculty member and administrator, serves as an excellent introduction to this remarkable man, whose intellectual life is the subject of a richly informative chapter from the book Living Legacies at Columbia. In an interview, Barzun once observed that "we honor [an artist] best by reading him, by playing his music, by seeing his plays or by looking at his pictures." The reference to reading applies equally well to historians. Happily, Barzun has been a prolific author of books written for the general reader as well as for scholars. Among our favorites are Begin Here: The Forgotten Conditions of Teaching, The Use and Abuse of Art, and From Dawn to Decadence: 1500 to the Present: 500 Years of Western Cultural Life (if you purchase this 877-page volume, we strongly recommend the hardcover edition for ease of reading--even if your eyesight is good!). A comprehensive listing of Barzun's books, compiled in order of popularity, is posted at LibraryThing ( "the world's largest book club")--see also his page at Amazon.com . For our part, we will celebrate Barzun's centenary by re-reading favorite sections in From Dawn to Decadence. In this book, Barzun touches upon the lives and thought of the giants of Western civilization in the period covered--in fields ranging from religion and government to science and the arts. What we found most inspiring, however, was making the acquaintance of men and women previously unknown to us. We had not heard of Sydney Smith, for example. A "mere vicar stuck away in a country parrish," he came upon the scene in the early nineteenth century, "when England had been debating reforms for fifty years and had adopted none." Barzun devotes more than five pages to this "mere vicar," who became an influential pamphleteer "propounding what was just, humane, and tolerant without himself ignoring these virtues by writing like a fanatic." Among the causes Smith took up were the education of women and the plight of children pressed into service as chimney-sweeps at the age of five or six. Famed for his wit and humor, Smith "had to struggle with poverty and disappointment" during the first half of his life, but ended as a beloved figure, rising to the post of Canon of St. Paul's in London. The book is full of such characters, and Barzun is their ideal chronicler. If the idea of celebrating Barzun's centenary by reading or re-reading his work appeals to you, you might choose any of his many other books. For the pleasure of sheer browsing, we recommend the Jacques Barzun Reader , a collection of essays on topics ranging from history and language to crime novels and baseball. Articles to Read: "Age of Reason," by Arthur Krystal (New Yorker, October 22, 2007); and "Jacques Barzun at 100," by Jeffrey Hart (New Criterion, November 2007). Website / Weblog: The Jacques Barzun Centennial / Barzun 100, both by Leo Wong. Barzun comments on Aristos and What Art Is. Jack Schaefer (1907-1991), author of the now-classic short novel Shane (1949) would have been 100 years old on November 19th. After the publication of Shane--as Louis Torres has argued in "Jack Schaefer, Teller of Tales" (Aristos, October and December, 1996)--Schaefer "went on to complete a body of work that ought to have assured him a respected place in the annals of American literature," on a par with such writers as Willa Cather, Ernest Hemingway, and John Steinbeck. Yet today most of his fiction is out of print, and he is virtually unknown. His misfortune is to have been relegated to the status of a writer of "Westerns," a genre little esteemed by literary scholars and critics. We had intended to celebrate his centenary by updating, revising, and re-designing our website pages dedicated to him, and may still do so before the year is over. In any case, we will honor him by re-reading select passages from his fiction--the short stories [search for "Collected Stories of Jack Schaefer"] perhaps, or one or both of his two finest novels--Monte Walsh (see also "Monte Walsh--The Last Cowboy") and Company of Cowards [search for title], which is set during the Civil War. Needless to say, we recommend that Aristos readers sample or revisit Schaefer's incomparable work this year as well. Andrew Wyeth: Watercolors and Drawings--an exhibition of works inspired by the rural life of Wyeth's Maine neighbors Christina and Alvaro Olson--is on view through December 16 at the Butler Institute of American Art in Youngstown, Ohio. Christina Olson, as some readers may know, was the subject of Wyeth's Christina's World [more ] [more], one of the best-loved paintings in American art. In "America's Greatest Living Painter" (Notes & Comments, June 2006)--on Andrew Wyeth: Memory and Magic, the retrospective exhibition at the Philadelphia Museum of Art last year--I misreported that Barracoon (1976), a depiction of a young black woman resting or sleeping, was inspired by a watercolor Wyeth had made of his frequent model Helga Testorf. I also stated that the model in the reimagined version at the exhibition was Evelyn Smith--whom Wyeth had painted as early as the 1930s, as I have since discovered (see "Wyeth's Black Models," ArtNews, May 2001). In fact, as he himself notes in Andrew Wyeth: Close Friends (2001), the model was Betty Hammond, who had worked for the Wyeths since the 1960s. The figure's hands (left unfinished in the earlier watercolor) are his own, he reports. (Unfortunately, I can find no online images of the painting.) The book from which this information is taken comprises photographs of paintings and works on paper of his black friends and neighbors in Chadds Ford, Pa., along with annotations by Wyeth and an Introduction by his wife, Betsy James Wyeth. -- L.T. 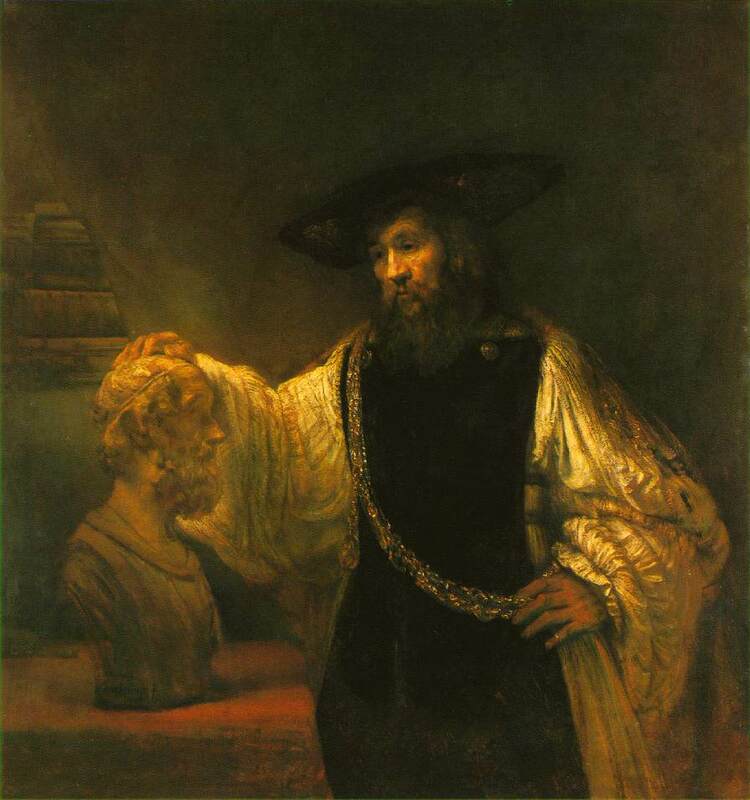 The paintings by Rembrandt alone (there are twenty in the Met's collection) would warrant a visit. Some highlights: Woman with a Pink [more] (gallery 5); Self-portrait, 1660 (gallery 5); Hendrickje Stoffels, 1660 (gallery 6); and Aristotle with a Bust of Homer, 1653 (last gallery - 12). Notable paintings by lesser-known artists include the Young Woman with Red Necklace (Study Head of a Young Woman) [more] in the style of Rembrandt, c. 1645. A recent bequest, this sensitively rendered work--thought to have been made as a training exercise by Samuel van Hoogstraten, a pupil of Rembrandt, when he was about eighteen years of age--is one of the gems of the exhibition (other fine works by van Hoogstraten, not in the Met's collection, are Woman at a Dutch Door [more ], and Self-Portrait, both dated 1645). Worthy paintings not directly related to Rembrandt include several by Gerard ter Borch (especially A Woman Playing the Theorbo-Lute and a Cavalier, c. 1658; and A Young Woman at Her Toilet with a Maid [more], c. 1650-51); Gerard Dou's An Evening School, probably from the early 1660s; and Hendrick Martensz Sorgh's A Kitchen. Needless to say, the Met's Vermeers--in particular, Young Woman with a Water Pitcher [more] [more], Study of a Young Woman [more ] [more], A Maid Asleep [A Woman Asleep] [more] [more] [more ], and Woman with a Lute [more] [more ]--are among the highlights of the exhibition. But don't miss the tender genre scenes by Nicholaes Maes--such as Young Girl Peeling Apples, which in its gentle way holds its own nicely next to Vermeer. Of related interest is our review of Love Letters: Dutch Genre Paintings in the Age of Vermeer (Aristos, March 2004). Jacob Collins--see his "Reflections on 'Classical Realism'" and letter in this issue--is the subject of "A Brush with the Past" in the Summer 2007 issue of the Columbia [Alumni] Magazine. This illustrated profile is full of interesting biographical details about Collins, who graduated from Columbia College in 1986. One charming revelation gives new meaning to the lyrics from "Some Enchanted Evening" [music] about a guy (in this case, Collins) seeing (and surreptitiously drawing portrait of) a girl "across a crowded room" (the college library's philosophy reading room) and knowing he'll see her "again and again" (he did, and they eventually married). Thanks to Michael Reed, whose article "The Intrepid Mrs. Sally James Farnham" is featured in this issue, we learned of the first illustrated monograph on this neglected sculptor: The Art of Being an Artist: Sally James Farnham, American Sculptor, by Peter H. Hassrick (the Preface is by Reed). A 72-page softcover volume, it includes some four dozen black & white photographs of Farnham's work (as well as a few of the intrepid Farnham herself and members of her family), and more than a hundred endnotes (but no bibliography or index). Published by the Frederic Remington Art Museum in Farnham's hometown of Ogdensburg, NY, the volume can be ordered from the museum shop. Paulding Farnham: Tiffany's Lost Genius is a lavishly produced volume about the life and work of the man who was Sally James Farnham's husband and who encouraged her to begin sculpture in mid-life, when she had been felled by a severe depression. Paulding Farnham enjoyed a brilliant career in his own right (albeit one tragically curtailed by a series of unhappy events) as "the greatest native-born jewelry designer the United States has produced"--in the words of the book's author, John Loring, Tiffany & Co.'s director of design since 1979. Farnham drew inspiration for his designs from traditions as diverse as those of precolonial America and the Italian Renaissance, as well as from nature (see, for his example, his Naiad Brooch and Orchid Brooch [scroll down] and Iris brooch). One of the most elaborate pieces incorporating figurative elements is his magnificent Adams Vase [more], crafted of gold from California's famed Ruby Mine [scroll down to item on the vase]. The full-page color plate in Loring's monograph does full justice to this remarkable piece (now in the collection of the Metropolitan Museum, whose image of it is comparatively dull), which was understandably acclaimed "a masterpiece of the goldsmith's art" when it was displayed at the 1900 Paris Exposition. As detailed in an appreciative review in Curtain Up, New York's Pearl Theatre Company (see Notes & Comments, January 2006) mounted a sparkling production of S. N. Behrman's 1932 drawing-room comedy Biography last spring. It is worth noting here that the play's captivating central character, Marion Froude, was probably inspired by Neysa McMein, a highly successful commercial artist who was a close friend of Sally James Farnham. To gain a sense of what life was like for our classical forebears, the next best thing to entering a time machine may be to visit the splendid new Greek and Roman Galleries at New York's Metropolitan Museum of Art. Opened to justifiable fanfare in April, the galleries are the fruit of a fifteen-year-long project to redesign the space and reinstall the Met's world-class collection of ancient Greek, Etruscan, and Roman art--much of it unseen in New York for generations. Online highlights indicate the breadth and depth of the collection, which spans more than three millennia and comprises art and artifacts ranging from an Early Cycladic Harp Player and an Archaic Greek Kouros to an Etruscan chariot adorned with scenes from the life of Achilles, a charming bronze Sleeping Eros, and wonderfully preserved Roman frescoes [more] [more]. The museum experience is enhanced by informative wall texts offering insight into the history and culture of each period. This outstanding permanent exhibition owes a great deal to the generosity of private benefactors--among them, the late Leon Levy and his wife Shelby White (who helped to fund the reconstruction of the magnificent peristyle court that is the centerpiece of the galleries), the late Bill Blass, and the late Frank A. Cosgrove, Jr. They merit public gratitude for their enlightened patronage. Federico da Montefeltro and His Library (Morgan Library & Museum, New York City, June 8 - September 30, 2007). If the term "Renaissance man" has become something of a cliché, this tiny but rich exhibition--confined to a 20-foot cubic gallery in the Morgan's new wing--revived its import. Offering a glimpse into the private study and library of one of the fourteenth century's most renowned rulers and patrons, it succinctly conveyed the breadth and depth of intellectual, religious, and worldly interests justifying that appellation--not to mention their often staggering contradictions. Federico (or Federigo) da Montefeltro, count and later duke of Urbino, was both a victorious condottiere (captain for hire) and an ardent humanist. He not only assembled one of the two greatest libraries of his day but avidly studied the books in it. In the painting that was the centerpiece of this exhibition (Double Portrait of Federico da Montefeltro and His Son Guidobaldo [more]) he is shown in full military regalia, reading one of the giant tomes in his collection, with his young son and heir at his knee. Some startling revelations also came to light in this exhibition, however. Despite his much-vaunted moral probity, this Renaissance man may not have scrupled, in the looting following one of his military campaigns, to confiscate Hebrew books from their Jewish owner for his library. There is also evidence that he played a role in the infamous Pazzi conspiracy against the Medici rulers of Florence in 1478. For more on Federico, see "A Window onto the Glory of the Italian Renaissance" in our April 2005 issue, and "Piero della Francesca's Uffizi Diptych" posted with this issue. At a time when some in the art world and many in the field of art education are concerned only with art's social and political implications, it is important to be reminded of its deeply personal value--in particular, for children. In that connection, one of the most inspiring sessions at this year's National Art Education Association convention in New York City in March was presented by Emil-Robert Tanay, Professor of Art Education and Teaching Methods at the University of Zagreb (Croatia). (We had the great pleasure of spending an evening with Tanay and his wife and colleague, Liljana Zaninoviæ Tanay [photos and bios], Director of the Studio Tanay.) At the height of the Serbo-Croatian war in the early 1990s, Tanay worked with children on both sides of the conflict who had been displaced and traumatized by the hostilities. As documented in an exhibition and catalogue entitled Heart in the Middle of the World, some of those young victims of the war were literally struck dumb by the horrors they had been through and were able to communicate their terrors only by embodying them in drawings and paintings--a process that slowly enabled them to re-enter life. 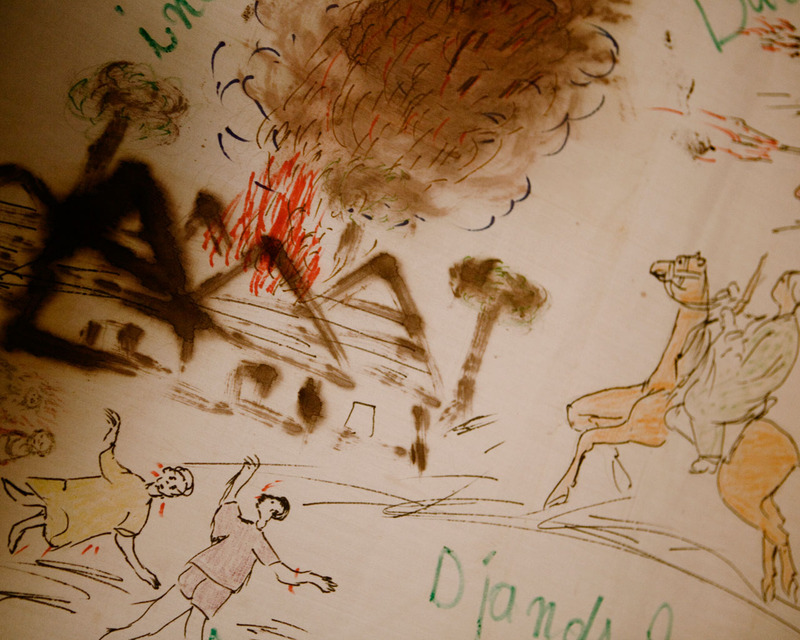 Equally telling is the drawing created by a Darfur refugee boy recalling the destruction of his village by Janjaweed horsemen. Caught on film by photographer Ron Haviv (who kindly provided us with a copy), the image was projected on the back wall of Carnegie Hall's stage during a stirring "Requiem for Darfur" benefit concert in January. It bore unforgettable witness to the cause at issue, providing a visual counterpart to the terrifying chords of the "Dies Irae" from Verdi's Requiem. Finally, there is the example of the Keiskamma Altarpiece [more], a work of communal folk art that has brought hope and healing to a South African village decimated by AIDS. 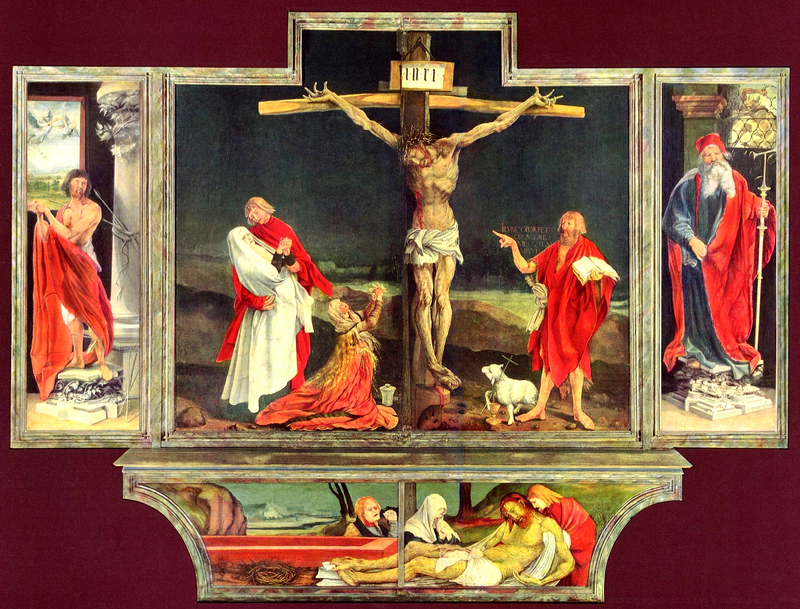 Inspired by Matthias Grünewald's Isenheim Altarpiece, the project was organized by Dr. Carol Hofmeyr--a physician who treats the area's AIDS victims--to help the people memorialize their dead, celebrate the heroic individuals who succored the ill and cared for their orphans, and begin to build a brighter future. The Dahesh Museum of Art, uniquely devoted to work by Europe's academically trained artists of the nineteenth and early twentieth centuries, has vacated its most recent premises at 580 Madison Avenue in New York City and is seeking a new location. For news of traveling exhibitions, future projects, and plans for the museum's new home, consult the Dahesh website. Michelle Kamhi's "Why Teach Art?" (Aristos, December 2006)--a review of Art and Cognition: Integrating the Visual Arts in the Curriculum, by Arthur Efland--has been reprinted with the addition of source notes in the March/April issue of Arts Education Policy Review, under the title "Reflections on Efland's Art and Cognition." This is the fourth article by Kamhi reprinted in that journal. The others were "Where's the Art in Today's Art Education?" (What Art Is Online, November 2002; AEPR, March/April 2003), "Rescuing Art from 'Visual Culture Studies'" (Aristos, January 2004; AEPR, September/October 2004), and "Modernism, Postmodernism, or Neither?" (Aristos, August 2005; AEPR, May/June 2006). U. K. web resources that cite Aristos include Baalbek, a "motley amalgam of links to philosophy, arts, news and English language teaching sites around the world," and Intute, a free online service that characterizes itself as "providing access to the very best Web resources for education and research" and further notes that all material "is evaluated and selected by a network of subject specialists." We continue to document new forms of bogus art, artworld buzzwords, non-arts articles featured on the front page of "The Arts" section of the New York Times, and "[Non-] Arts, Briefly" in the Times. Kudos to the Cranky Professor for poking fun at the New York Times for having published an article about a gift of Communist Party USA archival material to New York University in its Arts section last March. Louis Torres posted a brief comment in reply, pointing to our list of countless such transgressions by the Times. Though this is our first issue this year, we can assure you that we have not been on an extended vacation. To the contrary, we have been as busy as ever (as the contents of this issue partly testify). Further details will be forthcoming. We invite readers to comment on items published in this or past issues (see this issue and the Archives for examples). Letters may be edited for clarity or length, but the writer will always be consulted. If you wish to receive brief notices announcing publication of future issues of Aristos, please contact us. Your e-mail address will never be made available to a third party. If, perchance, you are already on our list and wish to be removed, please let us know.